A revolutionary, all-new approach to real-time trading. What if you could automatically run the best of all VectorVest’s strategies and view the results in a clear, concise format in real-time? 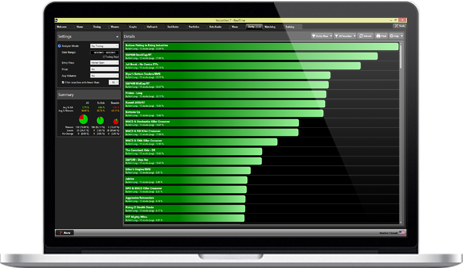 Or click on the best performing strategy to drill down to stocks and view a chart of that portfolio? Now you can, with the innovative automation available today in VectorVest’s RealTime Derby. Let the RealTime Derby Do The Heavy Lifting For You! Try RealTime Derby for 30 days, only £25. After the trial, add RealTime Derby to your VectorVest subscription for £79 per month or £875 per year. The RealTime Derby runs over 100 long strategies and over 30 short strategies as of the previous day’s close (or today’s open). It then creates a mini-portfolio of the top 10 stocks from each strategy, then tracks, ranks and displays each portfolio’s real-time performance from the opening bell to the close. Incredibly easy to use, RealTime Derby delivers The Information You Need, Displayed the Way You Want It!